Ethnicity data is usually gathered by asking people what their ethnic group is, either in a survey or as part of a service. As this is a sensitive question, we need to be clear about why we’re asking it and what the data will be used for as part of our usual good practice on collecting personal information from users. We also need to give users an easy way to tell us their ethnicity, for example a list of ethnic groups to choose from. 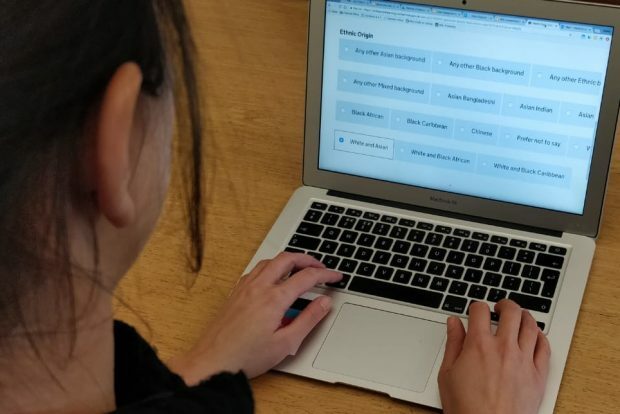 Our first step has been researching the different ways in which users are asked about their ethnicity. Here are 4 examples. 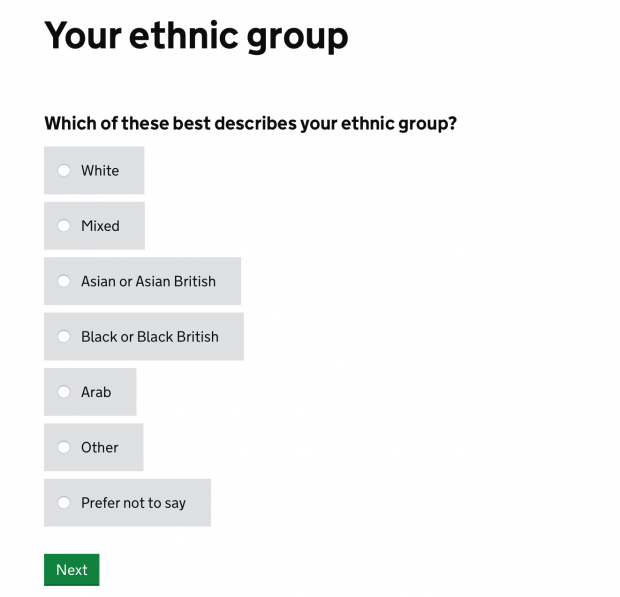 The Find an Apprenticeship service asks: “What is your ethnic group?”. It explains to users: “We need this information to make sure that we’re giving equal opportunities to all candidates”. Eighteen ethnic groups are presented in a dropdown box, grouped by 5 broad category headings - which appear as grey text in many browsers. 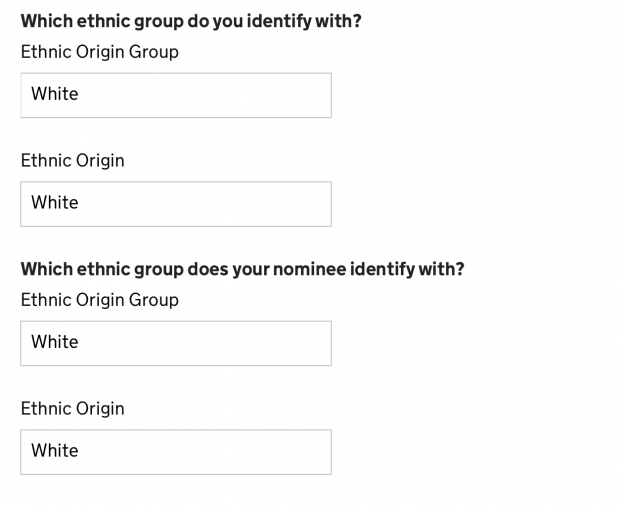 Users are also asked which ethnic group the person they’re nominating for an honour identifies with. The Universal Credit service asks: “Which of these best describes your ethnic group?”. Users are given 6 radio button choices, plus ‘Prefer not to say’. When they press ‘Next’, they are asked the same question but with a more specific list of radio button choices, based on their previous answer. The Metropolitan Police's online Report a crime service ask users for their ‘Ethnic background’. 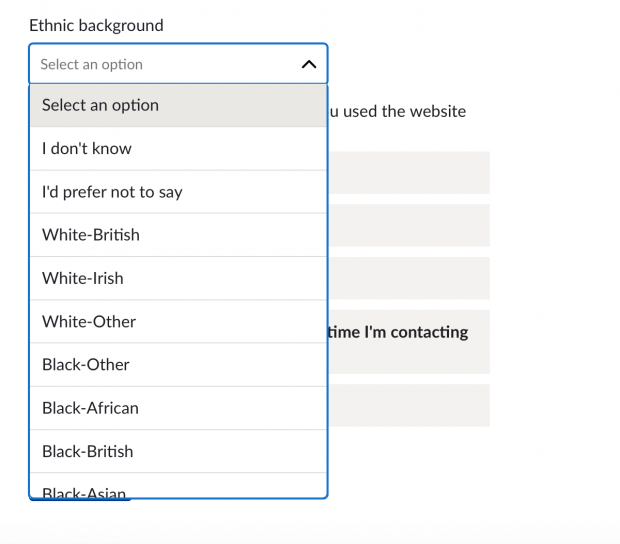 It gives users a single dropdown list, with options using a prefix such as ‘White-British’ and ‘Black-African’ to help users scan the list. We’re planning to do some user research, taking into account what we’ve learned from other services so far. We'll also look at the extensive work the Office for National Statistics has done on an ethnicity question for the 2021 Census. We're continuing to research the ways that government services ask users about their ethnicity and would love your help. If your service includes a question about ethnicity, or if you think it should, you can find me on the cross-government Slack channel, on Twitter @frankieroberto, or you can get in touch via email. 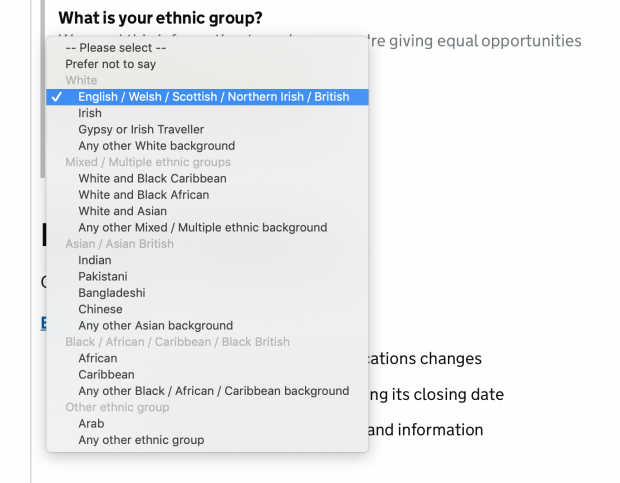 You can also add a comment to the GOV.UK design system backlog in Github, where there’s an open issue on ethnicity. great that you're looking into this, and so many different ways its being done at the moment. I look forward to seeing a consistent informed pattern coming out of it! These categorisations are confusing as white is not an ethnic group, it's a skin colour. Mixed in those categories are literal ethnic groups ie celts latin slave and geographic origins ie african or cultural origin ie arab or nationality ie indian, pakistani and chinese. Of course it needs to be easy for people to choose but it's misleading if one wants to be acurate and useless if one doesn't want to be acurate. How to describe a mediterranean ethnic group where a spanish (europe), a lebanese (asia), an italian (europe) and an algerian (africa) look so much alike. Apart from the name many mediterraneans are indistinguisable: how to avoid discrimination ? "What is your ethnic group"
So are we being asked about skin colour, cultural origin, geographic origin ? We plan to continue researching the way that the question is currently presented across government services. Nice Blog. The writing of this Blog is very useful. I’m truly speaking you are doing good job. Thank’s to share.